The Atlanta Braves enter the 2018 National League division series shorthanded as starting shortstop Dansby Swanson will sit out due to a partially torn ligament in his left hand. Swanson’s exclusion from the 25-man postseason roster came as no surprise after suffering the injury on Sept. 25 against the New York Mets. 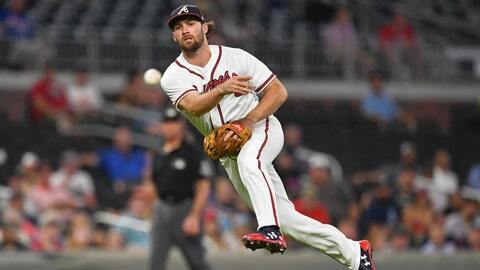 Utility standout Charlie Culberson, who stood in for Dodgers star shortstop Corey Seager last postseason during a World Series run, will step in as Atlanta’s shortstop. Swanson’s injury left the Braves’ front office with difficult decisions to make on its bench. The team will carry five bench options with two catchers (Rene Rivera and whoever does not start between Tyler Flowers and Kurt Suzuki), Lucas Duda, Lane Adams and Ryan Flaherty. Mike Foltynewicz gets the ball in Game 1 — and likely Game 5 if the series goes the distance — while the team announced veteran Anibal Sanchez will make the Game 2 start at Dodgers Stadium. The team will also carry five additional pitchers who made starts during the regular season in Kevin Gausman, Julio Teheran, Sean Newcomb, Max Fried and Touki Toussaint, though the latter two (or maybe three) will likely serve as bullpen options. Newcomb and Fried are considered rotation swing pieces if the organization deems it necessary to start a left-hander in NLDS Game 3 or 4. Snitker’s remaining bullpen options will be right-handers Arodys Vizcaino, Brad Brach and Chad Sobotka and left-handers A.J. Minter and Jonny Venters. "I've spent my entire career auditioning for this time right now."